Developing well-rounded individuals involves exposing them to opportunities where they can learn more about themselves and their community, broaden their world-view, and participate in clubs that highlight their strengths and help them excel. We offer clubs of common interest as well as nationally recognized clubs that offer graduation honors. Dive into art—its history and techniques—to develop a portfolio worth sharing. 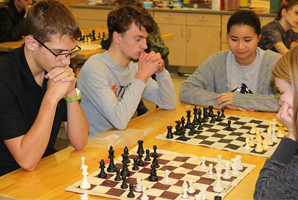 One of the main purposes of Art Club is to provide students the opportunity to make use of the art facilities at GHS beyond those provided by regular class instruction. Chess trains your brain for life. It teaches you think through your options before making a decision. And it’s fun. So join us and prepare to reap the benefits. Card Club meets once a week. Students gather to play a strategy game called “Magic: The Gathering” and/or trade cards to improve your personal deck. Fellowship of Christian Athletes (FCA) offers students encouragement and accountability in living out their faith on campus. Membership in Future Farmers of America is open to all students enrolled in an agri-science class at the Newaygo County Career-Tech Center. Our aim is to provide opportunities for students in leadership, citizenship, and scholarship development. We hold monthly meetings to discuss upcoming projects and activities. Discover and develop your talents in film and theater by helping us plan, perform, and produce school announcements, student dramas, and talent shows. Opportunities are available for behind-the-scenes work as well as stage experience. We produce two major shows each year. Members must have completed two years of a foreign language or be currently enrolled in their second year of language. We desire to provide students with opportunities to use their learned foreign language in real situations and to promote understanding between us and our foreign-speaking neighbors. Are you fascinated with the life of ancient Romans and Greeks? Do you love all things classical? Then join Latin Club! We meet the second and fourth Wednesdays of each month. 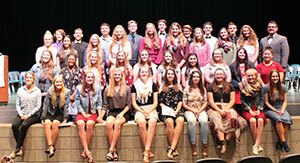 Our National Honor Society (NHS) is the nation's premier organization established to recognize outstanding high school students. More than just an honor roll, NHS serves to recognize those students who have demonstrated excellence in the areas of scholarship, service, leadership, and character. Stay fit during the offseason. Join Powerlifting to learn safe weight lifting techniques while building endurance and muscle mass. Discover knowledge. Discover friends. Discover an outlet for those random facts you’ve memorized. Discover Quiz Bowl! We meet a couple of times per week and begin practices in December. Competition starts in January. Use engineering techniques to design and build robots to showcase during annual competitions. For beginner and advanced skiers, our ski club plans several ski adventures each year on nearby trails and runs that will hone your skills and help you connect with others who love the sport. Any Grant High School student is welcome to join and take advantage of our discounted tickets. Ski Club may schedule trips for after school or on Saturdays. Our student government club develops student leadership while offering hands-on experience in a representative form of government. Our after-school academic support and tutoring club is open to all students who’d like a little extra help mastering concepts and procedures for classroom success.